"I know it's not how you would have chosen it, but I know I can make you happy." Memorable Moment - Just like the book, this film is a tear-jerker. There is no way to tell a story about a man wanting to end his life and the woman who tries to convince him that life is worth living, without tugging at the heartstrings. It's an intense subject. But one scene in particular really shows just how tough the idea of assisted suicide is, for those making the decision and for those who are left behind. That scene occurs on the beach at night, between Louisa and Will, and it's my memorable moment. After going on holiday in one last-ditch attempt to persuade Will that he should choose to live, Louisa hears his final decision - he hasn't changed his mind. 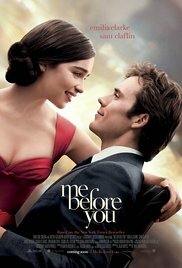 What happens next is, in my opinion, some very fine acting by both Emilia Clarke and Sam Claflin. They manage to show both sides of the assisted suicide debate and how neither side is right or wrong. Will has every right to choose when and how he dies. And Louisa has every right to be heartbroken by his decision. There is no perfect answer here, both of them are stuck in an horrific situation. Will has already lost everything, and Louisa stands to lose everything now. The way Emilia and Sam portray the harrowing emotions in this scene is wonderful. I could feel Louisa's pain, and Will's desperation. Such a powerful, genuine moment.